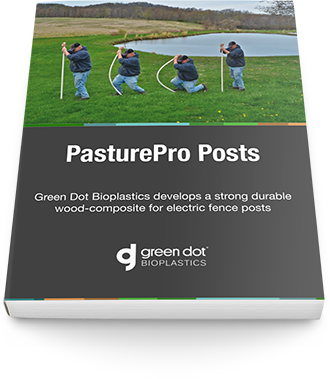 A case study on how Green Dot Bioplastics worked to identify a consistent wood pellet for the PasturePro Posts. Kencove Farm Fence Supplies (Kencove) is a nationwide manufacturer and distributor of electric fence supplies for animal containment and exclusion. How Green Dot Bioplastics worked with Green Forest Composites — the original manufacturer of the posts — to identify a consistent wood pellet. How the PasturePro Posts balance characteristics such as dielectric properties, aesthetics and flexibility. How the PasturePro Posts compare with traditional fiberglass and metal posts.